Arrive in New York City and begin a 12 day Eastern USA tour to Atlanta with guided tours of Washington DC, stunning Charleston, beautiful Savannah & more. Welcome to the USA! On arrival at New York International Airport you will be met and transferred to your hotel. Wonder at the concrete metropolis as you soak up the New York atmosphere. Discover New York City at your own pace with an included Hop-On Hop-Off Double Decker Bus Tour. Your ticket will allow you to explore over 50 stops throughout Manhattan and Brooklyn, from The United Nations to Times Square, from Harlem to Battery Park, including the ferry to the Statue of Liberty. You’re Invited: Enjoy a welcome dinner followed by an entertaining Broadway show. Known as the pinnacle of theatrical performance this truly is a special event. Make our way through Lancaster County, home to the religious Amish and Mennonite communities who are known for their simple and traditional lives. You’re Invited: We are joined by a local guide for a tour around the Amish countryside. Continue to the historically significant town of Gettysburg where the Battle of Gettysburg was fought. Day 4 - Gettysburg – Washington D.C. This morning we head to the Gettysburg National Military Park and Museum for a guided tour of the battlefields. Gettysburg was the war’s bloodiest battle with 51,000 casualties and it was also the inspiration for President Abraham Lincoln’s immortal “Gettysburg Address”. We then travel to the nations great capital, Washington D.C.
Day 5 - Washington D.C.
Our local guide joins us for a city tour as we view such highlights as the U.S. Capitol Building, the F.B.I. Building, Washington Monument, Lincoln Memorial, the White House and Arlington National Cemetery including the site of the John F. Kennedy Memorial. 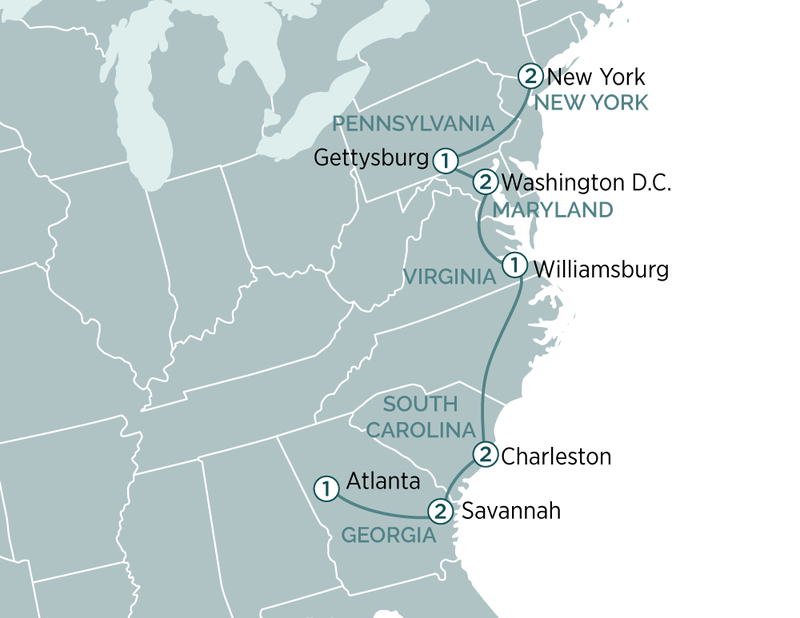 Continue through the state of Virginia to some of the most historic towns that still survive today. Discover Colonial Williamsburg and immerse ourselves in the 18th century capital city of Virginia. Colonial Williamsburg has been carefully constructed to recreate one of the most important times in U.S. history. Explore the revolutionary city and become a part of the recreation that brings history alive. Make our way from Virginia, through North Carolina to South Carolina. Pass into the delightful southern parts of America to the city that inspired the famous dance, Charleston. Charleston is the oldest city in South Eastern USA, is known for its history and well-preserved architecture, and exudes a rich historical charm. This morning we will be joined by our local guide for a tour through Charleston’s 300 year old historic district. Hear stories of the history and traditions of this gorgeous town as we make our way past mansions, gardens and churches. Wander along The Battery, a seaside promenade lined with stately homes where you can view Fort Sumter. The afternoon is yours to discover this delightful town. Head to picturesque Beaufort, a quaint southern town full of character and notable architecture. Continue to the attractive and historic town of Savannah containing one of the largest historic districts in the United States. We’re joined by a local guide as we uncover cobble stoned streets, oak lined alleys, exquisite southern mansions, beautiful squares and a picturesque riverfront. Tonight dine in a local restaurant that is a restored 18th Century cotton warehouse. Spend the day exploring the historic character of Savannah. Continue our journey to Atlanta. A city with a rich and passionate history, Atlanta was the birthplace of Dr. Martin Luther King Jr. Following in his father’s and grandfather’s footsteps, Dr. King became a minister and preached about peace through non-violence which helped shape the Civil Rights Movement. Learn more of the poignant history of America’s civil rights with a visit to the National Centre for Civil and Human Rights. We will then see the home where Dr. King lived for the first 12 years of his life, and the Martin Luther King Jr. National Historic site and monument. After breakfast you will be transferred to Atlanta Airport for your onward flight. We hope you enjoyed your Evergreen tour of Eastern America and hope to see you again soon! This 19 day New York City to New Orleans tour will see you visit some of America's most iconic cities; New Orleans, Nashville, Washington DC & Memphis. Enjoy an 11 day Canadian Rockies experience, 7 nights on a luxury cruise ship & a 19 day Eastern USA tour on this journey from Victoria to New Orleans.